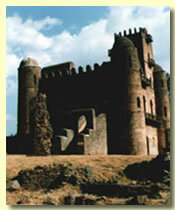 Day One fly in to Gondar, check into hotel and visit local castles. These unique multi-activity programs includes highlights of the popular northern Historic Route, trekking in the Simien Mountains, and rafting on the Blue Nile River. 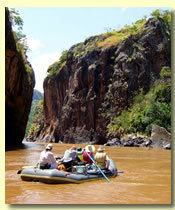 In our search to discover the wonders of Ethioipa, we travel by plane, 4x4, foot and raft. From the moment you step off the plane we will take care of everything. You'll have the opportunity to see the Castles of Gondar, the rock hewn churches of Lalibella, the ancient monestaries of Lake Tana, and the stunning scenery of the Semien mountains. Add this to a spectacular trip down the Blue Nile River and you will have a two week vacation filled with a lifetime of memories. This amazing trip is so easy for you to get involved in, we sort out everything for you from airline tickets to the itinerary. It's not often you get to go on such a great trip that has been completely organised for you, all you have to do is enjoy yourself.